This year's event was bigger and better than ever. 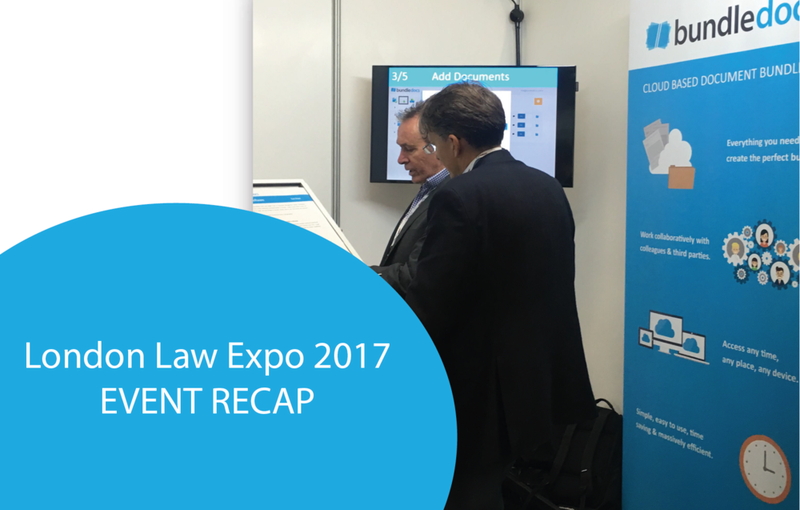 Spread over 2 floors, the London Law Expo/European Legal Security Forum 2017 explored a wide range of topics, issues and opportunities to assist law firms and allow legal businesses increase their overall performance, profitability and levels of IT security. Positioned at Stand #A22, our team were on-hand to give on-the-spot demonstrations, showcase our powerful integrations - as well as give a sneak peak at some of our latest feature developments (trust us they're good!). The event was particularly exciting for us all here at Bundledocs with the addition of our new Sales Director Matt Breen to the stand! Through-out the event, we were delighted to catch-up with many of our happy customers, as well as meet some new faces. Big thanks to everyone who stopped by - and NetlawMedia for another superb event! Regardless of whether you were able to make this year's event or not, make sure to get in touch. We would love to hear from you. We can even get you setup with a free online demonstration and/or free 30 day trial. With no obligation and no credit card required, you can simply test it all out and see if Bundledocs is the solution for you! Is Bundledocs the solution for you?